"When your blessing lovingly given to others returns to you, as it surely will, you will find that your world has changed. It will be peopled with friends. Everything without and within carries a blessing of love, unity, and wholeness to your body temple." ~Charles Fillmore, You Can be Healed! Our Unity Creators are knitters, sewers and crocheters. We create blankets, scarves, prayer shawls and other creative things to give to cancer patients, hospice house, special olympics, children's hospital, etc. ​their children are in the hospital. Check with our coordinator to see what's required. Cooking not necessary-we drop off ingredients. If you use cans with tabs, it only takes a few seconds to pull off the tops and bring them to church on Sunday. It is a cost-free way for us to help in this project. need our help to feed the hungry. ​we will take it to a local center. it will fill our barrel to overflowing. place in the Big Brown Basket. bag one of each item and create a love note for the receiver of the bag. that Amazon will donate towards? 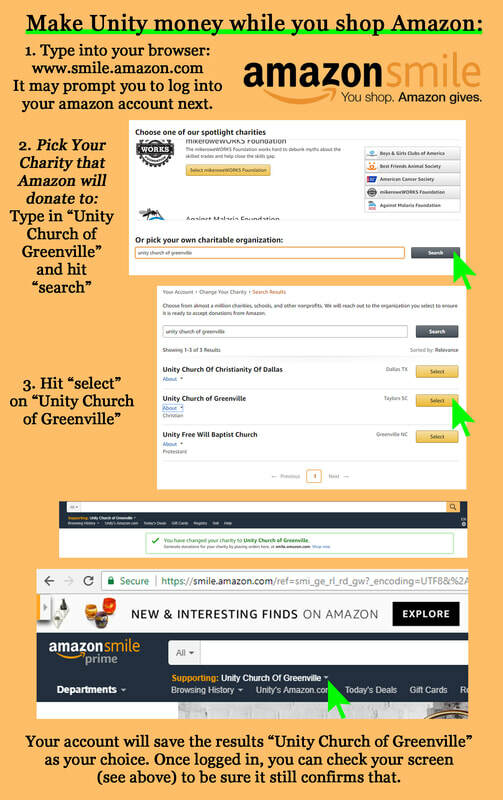 This is a great way you can give without $ coming out of your pocket and Unity can receive $ towards our own purchases as we shop to maintain the facilities. We have been receiving amounts $ credited to our account each month due to shoppers who choose us-- THANK YOU! !